King of Dragon Pass [$9.99] originates from what I consider to be on the tail end of the golden age of PC gaming, where developers focused more on depth and originality instead of texture resolution and polygon count. 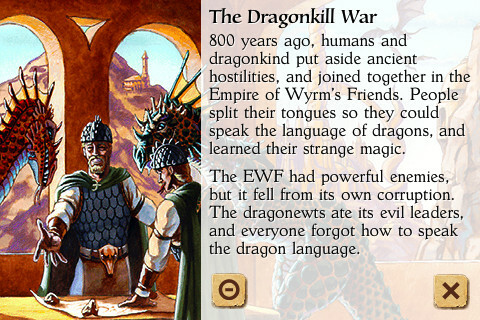 In fact, King of Dragon Pass is a fantastically extreme example of this as there’s no polygons to speak of, and the graphics only really consist of a assortment of hand-drawn illustrations to accompany whatever event is taking place at the time. I think the easiest way to describe what the game is all about is to call it a largely text-based menu-driven mash up of a Civilization game and a Choose Your Own Adventure book. If you’re the kind of person who requires flashy graphics, fast action, rock-bottom pricing, and online multiplayer, stop reading now. This is not the game for you. 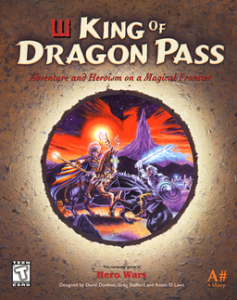 If, however, you can barely even fathom a more glorious conglomeration than Civilization and Choose Your Own Adventure, prepare to absolutely lose yourself in King of Dragon Pass. 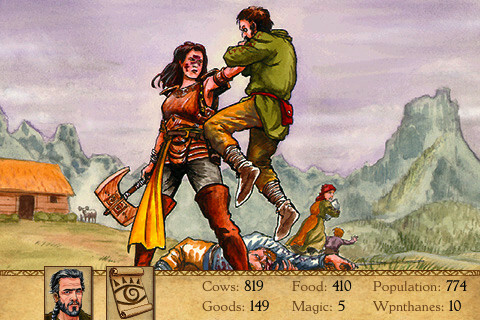 The game is set in the fantasy world of Glorantha, created by Greg Stafford, and used in several other traditional roleplaying games, literary works, and even a board game. The universe was originally imagined in 1966, and is chock-full of things which have since become standard in fantasy-based worlds. The people of Glorantha are the pawns of an array of both new and old gods who offer various benefits in exchange for worship. Magic and supernatural occurrences play an important role in the world, and aside from the typical races found in most fantasy worlds like elves, dwarves, etc, Glorantha is also home to strange humanoid hybrids such as anthropomorphic ducks and scorpion-men. It’s in this world where your clan will settle. The game begins with a brief history of your clan, which goes all the way back to the “Godtime" where gods and people lived side by side. 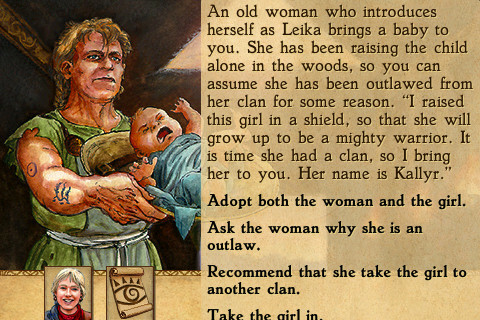 This part of the game plays very similarly to a Choose Your Own Adventure book, with the game tossing a hefty amount of backstory at you while offering you choices along the way where you decide things like your clan’s main deity, how you feel about dragons, how much land you’re going to take up, and other things like that. The cool part about this, which persists through the rest of the game, is that there’s no wrong answers to any of these questions. You never hit a point where one decision you made caused the game to end, instead, the decisions you make have consequences, and a main part of King of Dragon Pass is how you deal with those consequences– But more on that later. After you establish your clan’s history, you come up with a name (mine have all been fart-centric) and decide if your clan is going to be peaceful, balanced, or focus on war. From there, you decide on either a normal or hard difficulty, with the main difference here being what your clan starts with. On normal, you’re dropped into a reasonably well equipped settlement with existing trading partners and allies. Alternatively, on hard mode, the game basically treats your clan like you just wandered to a plot of land and decided to make it your home. From there you can choose one of two victory conditions in either “short" or “long" games. In a short game, you win by forming a tribe with neighboring clans, getting one of your clan members elected to be the tribal king, and hold that position for ten years. In a long game, you’ll need to take this one massive step further in convincing other tribes to form a kingdom, and lead one of your clan members’ ascension to the position of King of Dragon Pass. Accomplishing these goals is ridiculously difficult, and requires a serious understanding of the game’s mechanics. King of Dragon Pass comes with a huge in-game manual (huge for an iOS game, anyway) which I seriously recommend reading cover to cover. The depth of the game leads to various systems which you’d never utilize or fully understand otherwise, which was the source of every single frustration of mine with the game initially. There’s a small tutorial which helps you get started, but I think the best tutorial would have just been a huge button that says “No, really, read the manual." These various mechanics involve everything you can imagine that would go into managing a fledgling clan trying to make it in the world. You’ll need to keep an eye on your clan’s population, the number of people filling various roles in your clan, and how many of them are sick or injured. Everyone in your clan has to eat, which requires either successful farming, or trading with nearby clans. Also, a clan without wealth can’t really be taken seriously by other clans when forming alliances or trade agreements, so you also need to keep up your production of goods and establish trade routes to keep the economy flowing. Exploring is also important to find new clans to engage with, who might not always be friendly… Which is where your clan’s defensive and offensive capabilities come in. As I’ve played, I’ve chosen to take a defensive stance and really only attack when provoked, but you could just as easily be a warring tribe and let your proverbial fists do the talking when it comes to negotiating and taking what you want from other clans. There’s so many more little ins and outs that I can barely even summarize them all, even after spending nearly a week with the game now I feel like I’m still finding new ways to approach challenges. These random challenges are what initially attracted us to the game. They happen quite often, and always keep you on your toes. These random occurrences could be something like a surprise raid from a feuding clan. 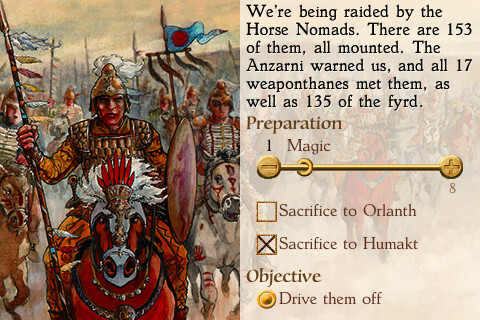 If you’ve got a force ready to fight, you could take them head on, or if you’re vulnerable because you’ve sent most of your warriors to accompany a particularly valuable trade caravan you might opt to focus on evasive maneuvers and survival. Explorers could stumble across a potentially powerful set of runes, but how you choose to deal with them could potentially result in upsetting your clan, the gods, and other things down the road. Refugees from other clans can seek admittance to your clan, and you can decide whether to greet them as equals, or take them as slaves. These random events can be completely ridiculous too– The best example I’ve seen of this is a ghost that potentially comes to haunt your settlement. Among other options, you can pursue legal action… And depending on how you’ve structured your clan and the strengths of your leaders, it can work. What I like most about King of Dragon Pass is the seemingly infinite possibilities that the game has. The previously mentioned random occurrences are drawn from a pool of around 500, but none really ever have a “right" or a “wrong" answer. As you role-play your particular clan and play to its strengths, you could see the same problem pop up in future games, but the way it’s dealt with and the outcome could be substantially different. Similarly, the simulation engine that powers the whole thing seems to completely embrace the whole “there’s no wrong way" philosophy that permeates the entire game. Success, it seems, comes from really playing the game making decisions as if you actually were a part of your clan. Just because there’s not necessarily a right or wrong way to do things doesn’t mean that your approach can’t fail. 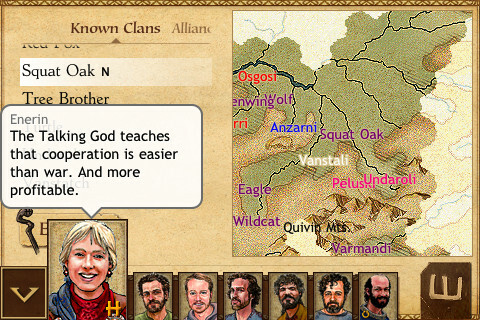 In fact, you’ll likely fail quite a bit as you get a handle on the game… But, understanding why you failed, and consulting the manual to learn what you could have potentially done differently to better manage the events that ultimately lead to your clan’s demise is ridiculously rewarding. Similarly, the flexibility of King of Dragon Pass doesn’t make it an easy game either, even on the easy difficulty level. I think it most reminds me of playing a fairly realistic flight simulator in that you can realize your plane is going down, and you know you need to pull up, but there’s also all these other buttons and switches that need to be hit at the right time and in the right order to make what seems like a simple maneuver actually transpire properly. In King of Dragon Pass terms, you could have a random occurrence that suddenly leads to a disease outbreak amongst your farmers. The more time your farmers spend in bed sick, the less time they spend producing food for your clan. “Heal the farmers" seems like the obvious answer, just like pulling up in a flight simulator, but it’s not that simple. To heal via magical means, you’ll need to sacrifice to gods. If you’re already low on resources, sacrificing even more can make the situation much worse. Alternatively, you could send out warriors to raid a nearby tribe to steal supplies from them, but the raid could fail, or worse yet, you could over-extend yourself and be defenseless if you get raided while your warriors are out on their raid. You could attempt to go out trading for food, but your caravan could be ambushed or not result in enough food anyway. It’s weighing all these options and executing the best potential course of events based on an entire dashboard of information on your clan has made what I initially thought was just a silly Choose Your Own Adventure style game into one of the most in-depth and strategic gameplay experiences I’ve had so far on my iPhone. I’m not sure how I’ll ever tire of it either, as the replay value is through the roof because of how much variance there is in every different clan and every situation. My only complaint with the game is that I wish it was for the iPad. The interface feels cramped at times, there’s some weird text scrolling issues that wouldn’t exist on a larger screen, but most of all– Games like this that I want to spend hours on end playing are just flat out more enjoyable on the iPad compared to hunching over your phone. There may be light at the end of the tunnel though, as the developers seem to be receptive of the idea and want to see how iPhone sales go first, but aren’t ready to commit to anything yet other than bug fixes to the small-screen version. Hopefully I’ve done a good enough job here explaining what this game is all about, as I think if you understand what King of Dragon Pass actually is, and you want it, there’s no way that you won’t love it. We try to avoid pricing discussion in our reviews, but I think in this case the $9.99 price point is totally appropriate. This is a deep game, and definitely targeted at a niche audience. That price point will make people stop and research what the game is before buying, then feel much more inclined to actually get invested and learn the game instead of tossing it aside like most of the other totally disposable 99¢ titles flooding the App Store. I’ve had an absolutely fantastic time playing King of Dragon Pass. Its slow pace makes it a perfect mobile game. Nothing in it is real time, making it totally conducive to just open the game up, send a trade caravan off, then come back to it later without any negative consequences. Cultivating a successful tribe is totally rewarding, and the random occurrences always keep you on your toes so it never seems like you can just fall into a comfortable successful groove where your clan is just on cruise control. I’d love it for my iPad, but either way, I can’t get enough of King of Dragon Pass.